As our loyal readers know, at U.S. Global Investors we carefully monitor the price of gold. We pay close attention to the macro drivers moving the yellow metal, like government policy and cultural affinity spurring demand globally. We also monitor the micro drivers, like company management and quant factors that make one gold stock superior to the next. Gold’s qualities make it one of the most coveted metals in the world and a popular gift in the form of jewelry – this is what I call the Love Trade. 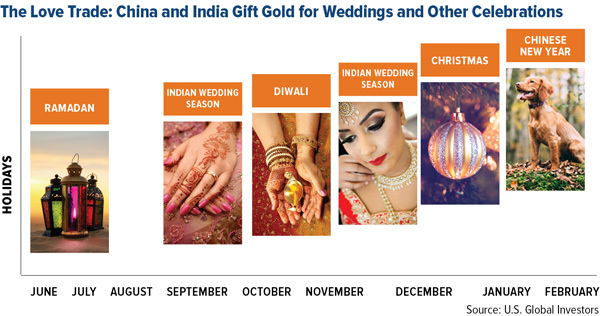 From the beginning of the Indian wedding season in September until Chinese New Year in February, the price of gold tends to rise due to higher demand from the two biggest consumers of gold, China and India. 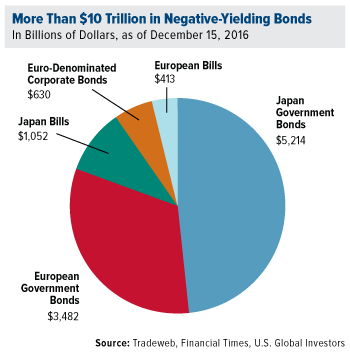 On the other hand is the Fear Trade, driven by negative real interest rates and the fear of poor government or central bank policies that could result in currency devaluation or inflation. This fear triggers people to buy gold as a hedge against possible negative returns in other asset classes, which in turn, pushes the gold price higher. 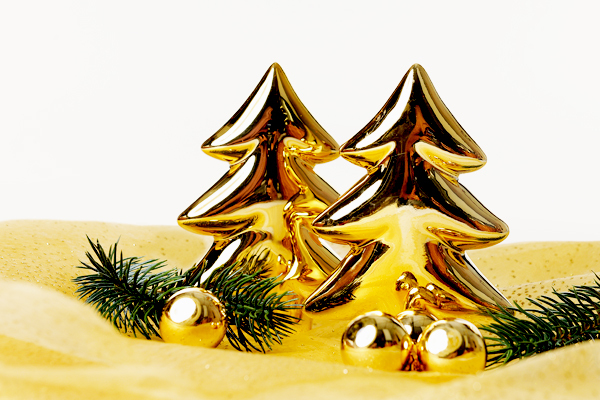 For more on gold’s seasonal trading patterns, download the free whitepaper Gold’s Love Trade. We believe gold is an essential part of a portfolio due to its history as a protector against inflation. I’ve always recommended a 10 percent weighting in the metal, 5 percent in gold bullion or jewelry, and 5 percent in gold stocks, mutual funds and ETFs. In fact, current economic conditions make an even greater case for gold. The stock market is still on a historic bull run, and the tax reform bill is helping ratchet up share prices. It’s important to remember that the precious metal has historically shared a low-to-negative correlation with equities. For the past 30 years, the average correlation between the LBMA gold price and the S&P 500 Index has been negative 0.06. 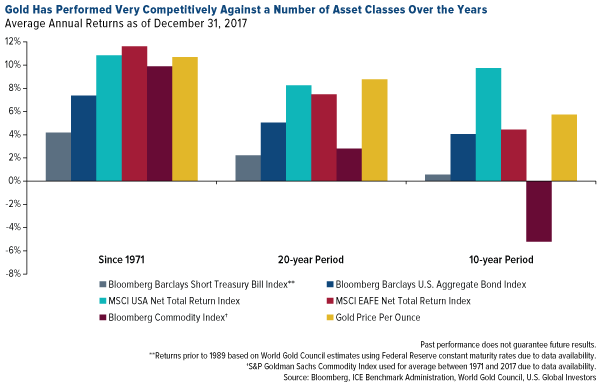 Gold has also performed competitively against many asset classes over the past few decades, as seen in the chart below. This makes the metal, we believe, an appealing diversifier in the event of a correction in the capital markets or an end to the bull market. Our investment team brings knowledge and experience in a variety of fields, with one of the most notable being gold. As such, we have written numerous pieces about the precious metal. One of our most popular is the Many Uses of Gold slideshow that outlines eight different uses of gold, other than in your portfolio. From dentistry to electronics and space travel to currency, gold remains widely used in everyday life. We believe it’s important to truly understand the asset class you are investing in, and we hope this slideshow does just that. Explore gold’s many uses here! Recently, in the USA, a few firms promoting “self storage” precious metals IRAs have been trying to exploit the self-reliance streak running through bullion investors in a manner that could cause significant harm. IRS officials have already signaled that they see the formation of the LLC as a simple fiction to grant control over assets which are supposed to kept at arm’s length. ”Self storage” IRA holders seem likely to find their accounts disqualified, with taxes and penalties due immediately (as an early distribution of the full account balance). 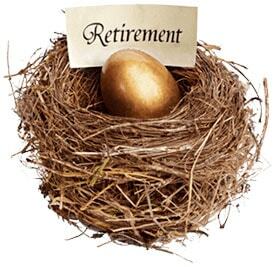 It’s telling that a few promoters of these risky “home storage” IRAs are also the bad actors when it comes to what products they promote. They aren’t really looking out for their customers. As readers of lawrieongold will hopefully be aware I publish most of my articles on the Sharps Pixley website. Unfortunately that website has been down for the past day while some admin difficulties with ICANN are sorted out. I also put occasional articles up on Seeking Alpha and US Gold Bureau websites – the latter only being accessible to North American domains unless one uses a web browser like Tor which enables one to access sites blocked to certain domains by making it appear you are accessing from somewhere which is acceptable. One of the most compelling and engaging presenters at the Precious Metals Summit in London last month was Ronald-Peter Stöferle, a managing partner at Liechtenstein-based asset management company Incrementum. Incrementum, as you may know, is responsible for publishing the annually-updated, widely-read “In Gold We Trust” report, which I’ve cited a number of times before. During his presentation, Stöferle shared the fact that his wife prefers to do her Christmas decoration shopping in January. When he asked her why she did this—Christmas should be the last thing on anyone’s mind in January—she explained that everything is half-off. A bargain’s a bargain, after all. This is very smart. Here we are several days before Christmas, and demand for ornaments, lights and other decorations is red-hot, so be prepared to pay premium prices if you’re doing your shopping now. But mere hours after the Christmas presents have been unwrapped and Uncle Hank has fallen asleep on the couch with a glass of boozy eggnog, stores will begin slashing prices to get rid of inventory. Gold bullion and mining stocks are currently in the “January” phase, so to speak, according to Stöferle. 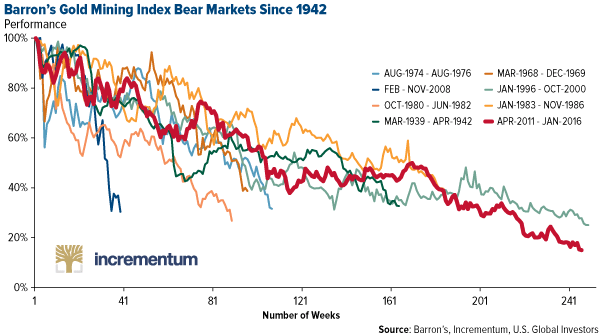 The Barron’s Gold Mining Index, which goes all the way back to 1938, recently underwent its longest bear market ever, between April 2011 and January 2016. And as I already shared with you, the World Gold Council (WGC) reported last month that gold demand fell to an eight-year low in the third quarter. The same logic applies to Christmas decorations, gold and mining stocks. As of my writing this, gold is trading around $1,280, up 11 percent in 2017. That’s off 5 percent from its 52-week high of $1,351 set in September. If it stays at its present level until the end of the year, the metal will end up logging its best year since 2010, when it returned 30 percent. Gold traded up on Friday as the U.S. dollar weakened following news that former National Security Advisor Mike Flynn pleaded guilty to lying to the FBI about conversations he had with Russian officials last December during the presidential transition. It’s possible that the details Flynn might provide as part of a plea bargain could help special prosecutor Robert Mueller advance his investigation into Russia’s meddling in the 2016 election. But back to gold. Considering it’s faced a number of strong headwinds this year—a phenomenal equities bull run that’s drawn investors’ attention away from “safe haven” assets, lukewarm inflation and anticipation of additional rate hikes, among others—I would describe its performance in 2017 as highly respectable. Dudas was specifically describing gold’s volatility, but even here the facts tell a slightly different story. 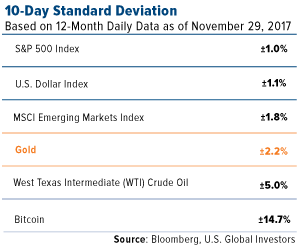 In the table above, you can see the 10-day standard deviation for a variety of assets, using data from the past 12 months. Gold traded with higher volatility than domestic equities, the U.S. dollar and global emerging markets. Of those measured, only oil and bitcoin showed higher volatility. Based on volatility alone, it’s stocks that look pretty “boring” and “quiet” this year, but you’re not likely to hear a pundit or analyst describe them that way. And with good reason. The S&P 500 hasn’t fallen more than 3 percent from a previous high for more than 388 days now, the longest stretch ever for the index. 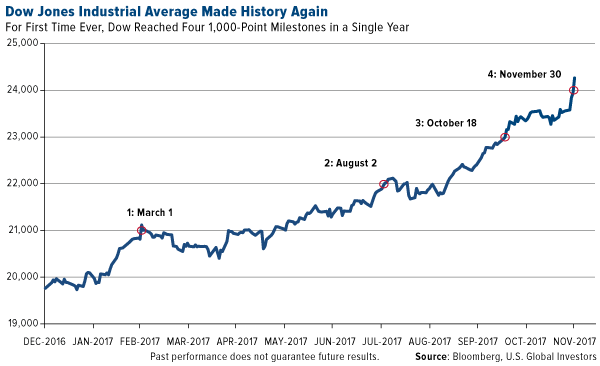 And for the first time in its 120-year history, the Dow Jones Industrial Average has reached four 1,000-point milestones in a single year—with a whole month left to go. It’s possible that excitement over the Senate’s tax bill will be enough to push the Dow above 25,000 sometime before the ball drops in Times Square. 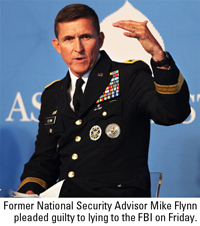 The drama involving Flynn, however, could threaten to derail those chances. What this means is that, compared to domestic equities, gold is highly undervalued right now. The gold-to-S&P 500 ratio, a time-tested trading indicator, is near 50-year lows. I see this as a strong buy signal, especially now as we await the Federal Reserve’s decision to lift rates this month. 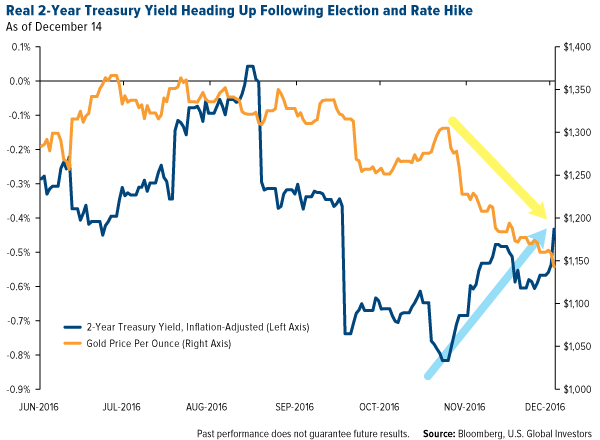 If you recall, gold broke out strongly following the December rate hikes in 2015 and 2016. So what are the catalysts that could trigger a breakout? Stöferle mentions two: a possible recession and stronger inflation. “I think the odds are pretty high that a recession might be upon us sooner or later because we’re in this rate hike cycle, and as always the central banks are way behind the curve,” he said. 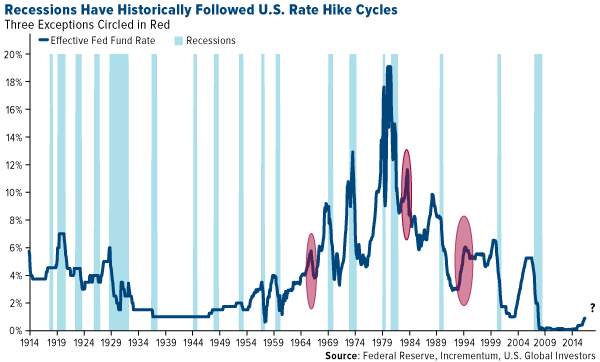 What Stöferle is referring to is the strong historical correlation between new U.S. rate hike cycles and recessions. Going back more than 100 years, 15 of the last 18 recessions were directly preceded by monetary tightening. The Federal Reserve isn’t just raising rates, remember. It’s also begun to unwind its $4.5 trillion balance sheet, which was built in the years following the financial crisis. This carries historical risk. The central bank has embarked on similar reductions six times in the past—in 1921-1922, 1928-1930, 1937, 1941, 1948-1950 and 2000—and all but one episode ended in recession. “Quantitative tightening will fail,” Stöferle predicted. Obviously, there’s no guarantee that this particular round will have the same outcome as past cycles, but if you agree with Stöferle, it might be prudent to have as much as 10 percent of your wealth in gold bullion and gold stocks. Inflation is a trickier thing to forecast. A lot of people, myself included, had expected the cost of living to show signs of life this year in response to some of President Trump’s more protectionist and policies. But nearly 10 months into his term, no major legislation has been passed or signed. That might be about to change with the highly anticipated tax reform bill, which the Senate passed late Friday night. If the bill reaches Trump’s desk, it will be the first time in a generation that the U.S. has amended its tax code. But will the $1.5 trillion bill, as it’s currently written, lead to stronger economic growth and pay for itself, as its most vehement supports insist? My hope is that it will. 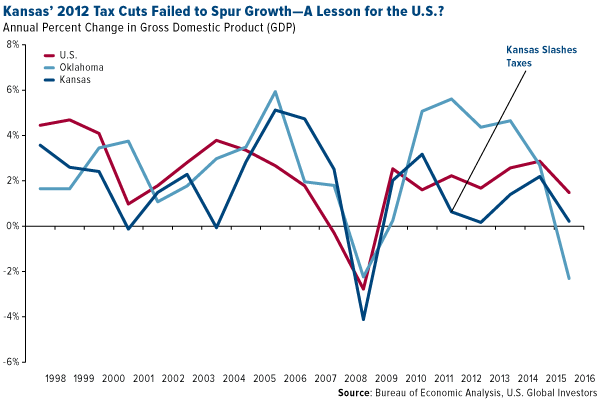 As I’ve been saying for a while now, it’s time we begin relying more on fiscal policies to drive growth, especially now that the Fed is beginning to tighten policy. In the spirit of staying balanced, though, there are troubling signs and forecasts that the bill could actually end up being a disappointment. After reviewing the bill, the Joint Committee on Taxation (JCT) estimates that its enactment could lead to a whopping $1.4 trillion increase in the deficit between now and 2027. Even if we factor in economic growth that might come as a result of reforms, the JCT says, we’d still be looking at a $1 trillion shortfall. Many economists are also skeptical. A recent University of Chicago Booth School of Business survey of economists from Yale, MIT, Princeton, Harvard and other Ivy League schools found that over half did not believe the current tax bill will “substantially” grow GDP. Only 2 percent thought it would, and more than a third were uncertain. Additionally, nearly 90 percent believed that if the bill is enacted, the U.S. debt-to-GDP ratio will be “substantially” higher a decade from now. And then there’s the Kansas experiment from five years ago. In May 2012, Governor Sam Brownback signed a sweeping state tax reform bill that in many ways resembles the Senate’s current tax bill. It slashed personal and business income taxes, consolidated the state’s three tax brackets into two and eliminated a number of credits and exemptions. Hopes were high that the reforms would kickstart economic expansion, help taxpayers and attract new business to the state. Instead, none of that happened. Following the bill’s enactment, Kansas GDP growth remained stagnant, trailing the national growth rate as well as that of neighboring states and even its own rate from years past. This year, the nonprofit financial watchdog group Truth in Accounting gave Kansas a failing financial grade of D, citing its inability to pay its debts or balance its budget. In June of this year, Kansas’ Republican-controlled state legislature voted to raise taxes for the first time since reforms were enacted and eventually had to override Governor Brownback’s veto. Many of those state legislators who initially supported the Kansas tax cuts are now warning federal lawmakersthat similar outcomes could occur on a nationwide scale. I’m not sharing this to discredit tax reform—in fact, I’m strongly in favor of it. However, I believe it’s important to highlight the fact that nothing in life is guaranteed. Hope for the best, prepare for the worst. What steps can you take now in the event the tax reform bill doesn’t accomplish what it’s designed to do—or worse? This type of uncertainly has historically made gold shine the brightest. I happen to think this is a mistake. As much as I believe in the value of bitcoin, gold and gold stocks still play a crucial role in the modern portfolio. As I told Kitco News’ Daniela Cambone at the Silver & Gold Summit, bitcoin isn’t responsible for dismantling gold. Although both assets are currencies, I don’t see them at odds because they serve very different functions. For one, gold is more than money—it’s worn as jewelry, widely used in dentistry and can be found in art and even some high-end foods. It’s been traded around the world for millennia and, unlike bitcoin, does not require electricity. Indeed, it conducts electricity, which is why you can find it in your iPhone and GoPro camera’s circuitry. Bitcoin is more than money as well. It’s the most influential spokesperson, if you will, of blockchain technology, upon which the currency is built. 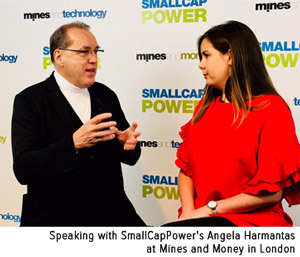 Speaking with SmallCapPower’s Angela Harmantas at the Mines and Money conference in London, I made the comparison that bitcoin is to email as blockchain is to the internet. In the earliest days of the internet, few people truly understood what it was or could predict the implications of this new technology—but email they understood. It’s what woke people up to the idea of using the internet. Bitcoin is doing just that for blockchain. But blockchain’s utility goes far beyond finance. As a decentralized, highly encrypted ledger, it has untold potential to change the way we run our lives, businesses and governments. Among other tasks, the technology can help manage digital rights to intellectual property, bring transparency to supply chains and reliably track the spending of public funds. It can even be used as a tamper-proof voting system, whether you’re voting for a new chairman of the board or president of the United States. One day soon, we might all be e-voting from our smartphones and tablets, reassured that our vote cannot be compromised. 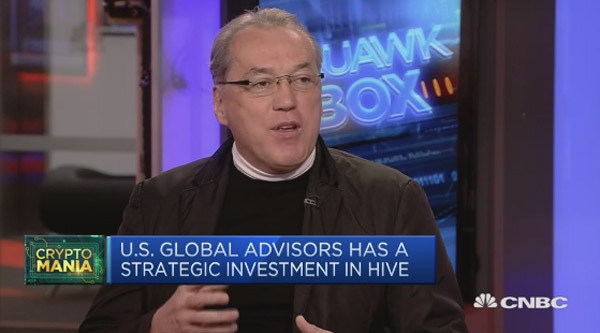 For more on my outlook on bitcoin and blockchain, and to get my thoughts on why I think HIVE Blockchain Technology is well-positioned to be an industry leader, watch my full interview with Angela Harmantas. Gold jewellery demand fell in Q3. Jewellery volumes continue to languish below longer-term average levels. Indian weakness was the main reason for the y-o-y decline. Tax and regulatory changes in India weighed on domestic gold demand. The new tax regime deterred consumers, as did anti-money laundering measures governing jewellery retail transactions. Inflows into gold-backed ETFs stalled: holdings grew by just 18.9t. Investors continued to favour gold’s risk-hedging properties, but the greater focus was on rampaging stock markets. Gold bar and coin demand growth was driven by China. Global investment in bars and coins rose 17% from relatively weak year-earlier levels. Chinese investors bought on price dips, to notch up a fourth consecutive quarter of growth. 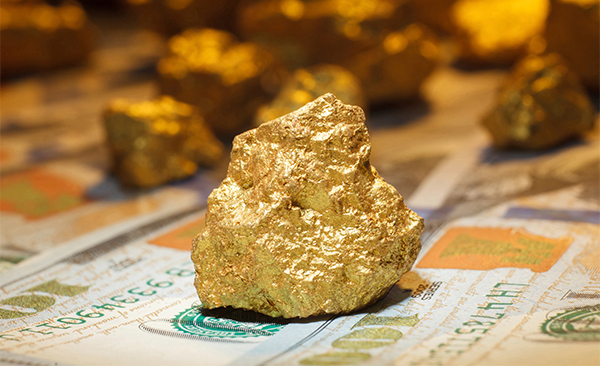 Volumes of gold used in technology increased for the fourth consecutive quarter. Demand for memory chips continued to soar thanks to the persistent popularity of high-end smartphones. The inverse of the extreme overvaluation in equities is the extreme relative cheapness of hard assets. Commodity indexes entered the summer at generational lows in real terms. The perception has been that the world is awash in plentiful, cheap oil. Just a few years ago, with oil over $100 per barrel, the headlines blared warnings about peak oil and supply shortages. At major cyclical turning points in commodity markets, the news tends to reinforce whatever trends brought about major highs or lows in prices. 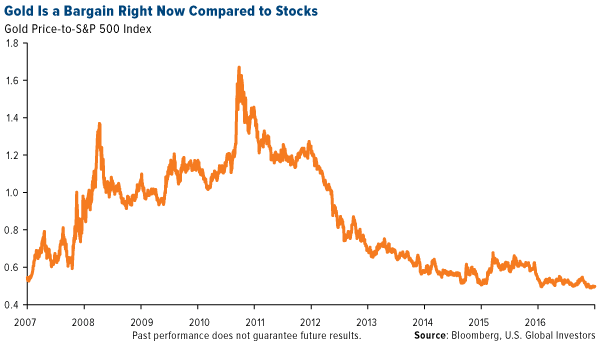 What investors need to keep in mind is that commodity markets are always cyclical in nature. No matter how bullish or bearish the outlook happens to appear at any given time, prices will eventually turn and trend in the opposite direction. Oil and agricultural commodities perked up as summer officially began. Whether it’s the start of a major cyclical bull market remains to be seen. 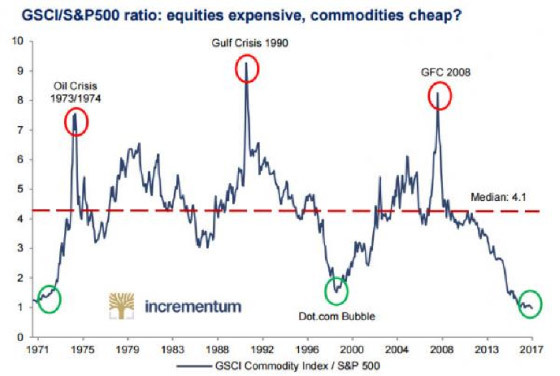 But the supply and demand fundamentals are setting up bullishly for commodities markets. The cycle for any commodity follows the same basic pattern. When prices are low, production falls. As new supplies diminish, the market tightens and prices move higher. The higher prices incentivize producers to invest in production capacity and increase output. Eventually, the market becomes oversupplied, prices fall, and the cycle starts all over again. As a resource investor, it’s important to have some idea of whether you’re investing in a commodity at a time in the cycle when it’s favorable to do so. Gold, for example, tends to be less correlated to swings in the economy than oil and industrial commodities. It responds more to investor fear and flight from paper asset markets. Chart reading is always a tenuous undertaking, but when combined with supply and demand fundamentals it can help investors identify favorable times to be a buyer or seller. 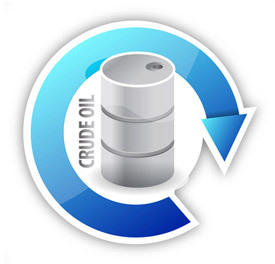 Right now it appears that gold, silver, oil, and other commodities are transitioning one by one into a period in the commodity cycle of diminishing supply. In the case of crude oil, the major storyline in recent months has been a supply glut. North American shale production has swelled inventories in the U.S. The longer-term supply outlook actually augurs for shortfalls… and much higher prices. According to the International Energy Agency (IEA), new oil discoveries last year sunk to their lowest number in decades. The IEA warns that in order to offset recent declines and meet rising global demand, the oil industry will need to develop 18 billion new barrels every year between 2017 and 2025.Oil’s recent price range in the low $40s to $50s per barrel doesn’t seem to be incentivizing the necessary new production capacity. Higher energy costs would mean higher production costs for the gold and silver mining industry. Mines are already having to process more and more tons of earth to extract ounces of precious metals. The cycle appears to be in the early stages of turning bullish for commodity prices – making it a favorable time to be taking out long positions in hard assets. That doesn’t necessarily mean metals markets will immediately begin moving up in a big way. Gold and silver still face potential headwinds from two sources: first, another Fed rate hike or two before year end; and second, a vowed gradual reduction of the central bank’s QE-bloated balance sheet, which could cause longer-term bond yields to go up. Contrary to popular misconceptions, nominal increases in interest rates aren’t inherently negative for metals prices. More important is whether inflation, and expectations of future inflation rates, are rising or falling relative to interest rates. If oil prices break out of their trading range to the upside, that could help ignite inflationary fires. Gold Today –New York closed at $1,278.20 Friday after closing at $1,270.10 Thursday. London opened at $1,281.00 today. – The $: € was weaker at $1.1264 after Friday’s $1.1222: €1. – The Dollar index was weaker at 96.77 after yesterday’s 97.20. – The Yen was stronger at 110.51 after Friday’s 111.51:$1. – The Yuan was stronger at 6.8036 after Friday’s 6.8153: $1. – The Pound Sterling was stronger at $1.2905 after yesterday’s $1.2875: £1. New York closed $4.17 lower on Friday than the Shanghai Gold Exchange was trading at today ahead of Monday’s opening. London opened at around $1 lower than Shanghai was trading earlier today. These are very small price differences evidencing arbitrage operations at very professional levels [likely banking operations]. We have been watching these markets, as you know, very carefully over the last year. Our conclusion is that we are watching global gold market developments that are much more significant than the 2005 ‘de-hedging’ operations by gold mining companies and the establishment of gold ETFs by the World Gold Council. These changes not only bring structural changes to the global gold market but demonstrate where gold is going in the future. As China has integrated gold into its financial system, the weight of physical gold trading is being brought to bear on global gold prices. As the emphasis moves to physical dealing in gold, so its importance as an international reserve asset as well as an asset in support of global finances will increase in the months and years to come. We are now watching a three sides of the global gold market that is just about in sync. Shanghai is the most influential on gold prices as it is the physical, global gold bullion hub now. Silver Today –Silver closed at $17.52 Friday after $17.28 at New York’s close Thursday. We expect to see silver outperform gold as it rises solidly. The Technical picture for silver will become dramatic if the gold price rises further. LBMA price setting: The LBMA morning gold price was set today at $1,280.70 from Friday’s $1,260.95. The gold price in the euro was set at €1,137.04 after Friday’s €1,121.09. Ahead of the opening of New York the gold price was trading at $1,280.80 and in the euro at €1,139.60. At the same time, the silver price was trading at $17.56. The U.S. Friday’s jobs data disappointed markets, which were expecting much higher numbers. The figures imply that the momentum of jobs creation in the U.S. is waning. But the more important figure was the one giving the inflation picture which showed it was decreasing, a factor likely to influence the Fed’s decision to raise rates this month. 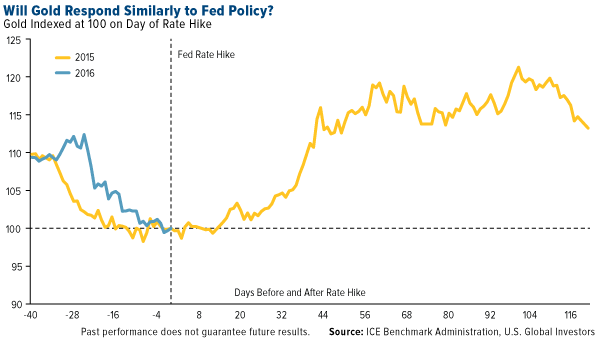 We ask, “Will they?” Markets are telling us that they will, but the Fed will be considering the impact on financial markets if they go ahead and raise rates. They will be keen to ensure nothing interferes with the moderate growth the U.S. in experiencing right now. As a result the U.S. SPDR gold ETF and other gold ETFs saw an inflow of funds which pushes them into the market to buy physical gold. This return of demand may well continue to push prices higher. At last, the Indian government has issued the level of General Services Tax to be levied on gold inside the country. It will be at 3% and was announced on Saturday by the Indian government [and is lower than industry expectations of around 5%] which will come into effect on July 1 and will replace a number of federal and state levies. The net effect is to raise taxes by around 0.5%, a figure that is going to make little difference to demand in the country. They are currently paying 1% excise duty and 1.5% VAT on gold. But the net figure paid by Indians for gold is to be 13%, when one adds the Customs Duty of 10%. There is talk that the government will reduce Customs duty, but that talk has been around for well over a year already. We cannot see that happening soon. As a result, India has a thriving gold smuggling industry that is now that little bit more profitable now. Two years ago the WGC guesstimated that that was 250 tonnes then. With its profitability even higher now, this well-established industry will undoubtedly be bringing in greater volumes. But that demand will not be registered in official figures, but analysts should add that sum to official numbers. Gold ETFs – Friday, saw purchases of 3.551 tonnes of gold into the SPDR gold ETF (GLD). There were purchases of 1.37 tonnes of gold into the Gold Trust (IAU) since their internet page went down. It has now been corrected. Their holdings are now at 851.003 tonnes and we presume, at 204.34 tonnes respectively. Since January 6th 2017 43.759 tonnes have been added to the SPDR gold ETF and the Gold Trust. Gold Today –New York closed at $1,228.80 Friday after closing at $1,226.30 on the 16th March. London opened at $1,232.75 today. – The $: € was weaker at $1.0765: €1 from $1.0754: €1 Friday. – The Dollar index was weaker at 100.16 from 100.38 Friday. – The Yen was stronger at 112.74:$1 from Friday’s 113.44 against the dollar. – The Yuan was stronger at 6.9051: $1, from 6.9068: $1, Friday. – The Pound Sterling was stronger at $1.2419: £1 from Friday’s $1.2343: £1. At the close in Shanghai today, the gold price was trading at 277.50 Yuan, which directly translates into $1,249.98. But allowing for the difference of gold being traded this equates to a price of $1,244.98. This more than $16.18 higher than the New York close and $12.22 higher than London. The price differential between the three centers is widening again as China once again is leading the way on gold prices. But you will note that Chinese gold prices have barely changed in the last two days leading to the conclusion that Shanghai is making the gold price but exchange rate changes are changing prices in other currencies. The dollar continues to weaken taking gold prices higher there. LBMA price setting: The LBMA gold price was set today at $1,233.00 up from Friday’s $1,228.75. The gold price in the euro was set at €1,146.34 after Friday’s €1,144.51. Ahead of the opening of New York the gold price was trading at $1,232.10 and in the euro at €1,145.71 At the same time, the silver price was trading at $17.40. Silver Today –Silver closed at $17.38 at New York’s close Friday against $17.32 on the 16th March. Silver prices have begun rising slowly in line with gold’s dollar prices. When we look at the G-20 meetings we are always underwhelmed. But this last one contained more significance as the U.S. refused to support, in the final communiqué, the words that implied all were agreed against ‘protectionism. President Trump has made it clear that he will ‘make America great again’ putting its interests over its trading partners. This is very definite ‘protectionism’. His highest profile targets are Mexico, China and now Germany. His objection is that there are Trade deficits with each of these countries. He wants a Trade Balance that has no deficit. This has great implications for gold prices. The U.S. has had a Trade deficit for as long as we can remember. It has been described as the ‘exorbitant privilege’ [of being able to pay for goods with printed paper and not through the sale of its goods] So why is the elimination of the Trade deficit of importance to the new administration? Yes, it will bring jobs back to the U.S., but seen through monetary eyes it is a step away from dollar hegemony to a dollar that can stand internationally on its own valuation through a balance, or surplus, on its Balance of Payments. It is preparation for a multi-currency monetary system in which Trump hopes the dollar will stay as strong as it is now. Protectionism through tariffs will go a long way to ensure this objective. This is why we see tariffs on oil imported into the U.S. in the future. It will stabilize the ‘fracking’ oil companies and move them away from international oil price dependency. This would be gold positive! Evidence of Trump acting on a hard line on this came over the weekend with his meeting with Chancellor Merkel of Germany. Gold ETFs – Friday saw sales of 2.962 tonnes from the SPDR gold ETF but no change in the Gold Trust. Their respective holdings are now at 834.100 tonnes and 197.82 tonnes. Since January 4th 2016, 230.89 tonnes of gold have been added to the SPDR gold ETF and to the Gold Trust. Since January 6th 2017 20.834 tonnes have been added to the SPDR gold ETF and the Gold Trust. Gold Today –New York closed at $1,256.70 on the 24th February after closing at $1,248.80 on the 23rd February. London opened at $1,255.00 today. – The $: € was slightly stronger at $1.0586: €1 from $1.0589: €1 on Friday. – The Dollar index was slightly stronger at 101.06 from 100.95 on Friday. – The Yen was slightly stronger at 112.30:$1 from Friday’s 112.85 against the dollar. – The Yuan was weaker at 6.8800: $1, from 6.8717: $1, Friday. – The Pound Sterling was weaker at $1.2412: £1 from Friday’s $1.2553: £1. At the close in Shanghai today, the gold price was trading at 280.0 Yuan, which directly translates into $1,265.84. But allowing for the difference of gold being traded this equates to a price of $1,260.84. This is $4 higher than the New York close and $6 higher than London. Shanghai opens the week pulling both London and New York higher again but with the two centers following close behind. LBMA price setting: The LBMA gold price was set today at $1,256.25 up from Friday’s $1,255.35. The gold price in the euro was set higher at €1,187.05 after yesterday’s €1,185.02. Ahead of the opening of New York the gold price was trading at $1,255.20 and in the euro at €1,185.94. At the same time, the silver price was trading at $18.37. Silver Today –Silver closed at $18.35 at New York’s close Friday against $18.18 on the 23rd February. Looking back over the last week, we see only purchases of 0.44 tonnes of gold into the U.S. based gold ETFs. This confirms to us that the upward pressure on the gold price is coming from the Far East, primarily Shanghai. This is remarkable as the gold price has risen around $20 in the same period, breaking through persistent overhead resistance on the way.It clearly shows that U.S. factors and U.S. buying has not provided the upward pressure on the gold price and confirmed our view that it has been upward pressure from Shanghai. Political uncertainty is certainly preventing any selling in the developed world as we move towards the Dutch, French and German elections. Italy is looking like a major source of such uncertainty too. Gold ETFs – Friday again saw no sales or purchases from or into the SPDR gold ETF or the Gold Trust. Their respective holdings are now at 841.169 tonnes and 201.82 tonnes. Gold Today –New York closed at $1,248.80 on the 23rd February after closing at $1,238.10 on the 22nd February. London opened at $1,254.00 today. – The $: € was weaker at $1.0589: €1 from $1.0545: €1 on yesterday. – The Dollar index was weaker at 100.95 from 101.36 on yesterday. – The Yen was stronger at 112.85:$1 from yesterday’s 113.20 against the dollar. – The Yuan was stronger at 6.8717: $1, from 6.8786: $1, yesterday. – The Pound Sterling was stronger at $1.2553: £1 from yesterday’s $1.2477: £1. At the close in Shanghai today, the gold price was trading at 279.50 Yuan, which directly translates into $1,265.10. But allowing for the difference in quality of gold being traded this equates to a price of around $1,260.10. This is $8 higher than the New York close and $7 higher than London. Bearing in mind that the prices of the 23rd [yesterday] above are the prices ahead of London’s opening and well ahead of New York’s opening. As you can see both London and New York were dragged higher by Shanghai. Looking at Shanghai’s closing prices today [not in the table as they have not yet been officially released], we are looking at prices over $1,260. If London and New York continue to follow Shanghai, which we believe will happen, then both London and New York will see good rises today. LBMA price setting: The LBMA gold price was set today at $1,255.35 up from yesterday’s $1,237.35. The gold price in the euro was set higher at €1,185.02 after yesterday’s €1,172.40. Ahead of the opening of New York the gold price was trading at $1,257 80 and in the euro at €1,186.16. At the same time, the silver price was trading at $18.30. Silver Today –Silver closed at $18.18 at New York’s close yesterday against $18.04 on the 22nd February. The media will continue to attribute rises in the gold price to events in the U.S. with an occasional nod towards gold ETF buying. But today we see there was no purchases into the U.S. based gold ETFs. The dollar weakened against most currencies, but even in the euro against which the dollar is most often measured, the gold price rose almost the same as it did in the dollar. So, today is a day when the gold price has again risen against all currencies, with Shanghai leading the way! This pattern, now that the slowdown in Chinese demand due to the Lunar New Year is out of the way, seems to be taking hold of the gold markets. It is a structural change in the global gold markets and appears to us that effective arbitraging [dealing between two markets] has become efficient. Banks that are permitted to take gold into China must be active in doing this but the main player has to be the ICBC which is a member of the price setting committee and a ‘market maker’ in London with their vaults, in total, accommodating 3,500 tonnes of gold for clients and itself. Gold ETFs – Yesterday saw no sales or purchases from or into the SPDR gold ETF or the Gold Trust. Their respective holdings are now at 841.169 tonnes and 201.82 tonnes. To ensure you can benefit from the future higher gold prices we will see then, you need to hold it in a manner that makes sure it can’t be taken from you. Contact us at admin@stockbridgemgmt.com to buy physical gold in a way that we feel, removes the threat of it being confiscated. We’re the only storage company that offers that! At long last Lawrie is out of hospital, although still far from back to normal physically, and hopes to resume posting on the site shortly. Much has occurred since he had his stroke around 8 weeks ago – notably of course Donald Trump winning the U.S. Presidential election. Virtually all the pundits, who were mostly pro-Hillary, predicted that a Trump victory would see gold soar and markets collapse, yet the reverse happened. Moral – don’t pay any attention to the pundits. Also has anyone else noticed that nearly all the media pictures of Trump pre the election were decidedly unflattering, yet most after it have actually made the Donald look almost Presidential! The media is talking up the U.S. economy likening Trump’s somewhat off-the-cuff policy proposals to Reaganomics. At some stage reality will rear its head. Trump remains a loose cannon on the political front. The next few years could prove to be ‘interesting times’ in the Chinese proverbial sense. Hillary would perhaps have been more predictable as President, but whether she would have proven to be a better leader of the so-called ‘free world’ we will presumably never know. Hospital stays are not really conducive to writing analytical articles which is why lawrieongold has not carried any original articled from yours truly for the past few weeks. My apologies, but am likely to remain in hospital for the next two weeks at least as I recover from a stroke which has left me unable to walk without assistance, and what is even more frustrating an inability to swallow so I’m being fed through a tube to the stomach via my nose. Muscular co-ordination isn’t great either, which makes typing a bit problematic. I have managed to write an article for sharpspixley,com looking at the aftermath of the Trump election win and its likely effect on gold and that is included in full as a separate article on the site. Meanwhile I will continue to publish articles from some commentators who submit material to me in order to keep readers up with is going on in the markets. Hopefully I’ll be back in full swing by the end of the year, but progress is frustratingly slow. After a slow start to 2016, the Kibali gold mine is picking up speed, with the substantial performance improvement forecast for the second half of the year already manifesting itself. Speaking at a briefing for local media, Bristow said Kibali was delivering progress on all fronts towards the achievement of its 2016 business plan, with a ‘step change’ in production expected in the third and fourth quarters of the year. Throughput was currently at or above the nameplate specification and there had been a big improvement in the recovery rate, while costs were also expected to be better. “In line with our policy of supporting local economic development in our host countries, all the contracts for the work on Azambi have been awarded to companies with a majority Congolese shareholding, while the main contractor, who will be working in partnership with our capital projects team, is 100% locally owned,” Bristow said. Bristow said despite the stresses associated with developing a project the size of Kibali in a remote part of a country that was still evolving politically, Randgold had a long term commitment to a partnership with the DRC and was laying the foundation for further investment there through its exploration programmes around the mine and further afield. “We see ourselves continuing to play a significant role in the growth of the Congolese mining industry,” he said. This commitment extended to its support for local economic and general community development through a range of initiatives. These include a number of large-scale agribusiness projects which are designed not only to provide economic activity and a secure food supply in the near future but also to leave a sustainable legacy to the community after the mine’s eventual closure. Randgold operates the Kibali mine in north east DRC which is a joint venture between Randgold (45%), AngloGold Ashanti (45%) and the Congolese parastatal SOKIMO (10%). Apologies to readers 0f lawrieongold for lack of erbut I am currently in h0spital having suffered a stroke and have limited typing ability. Meanwhile will endeavour to publish some articles from some of our regular contributors.